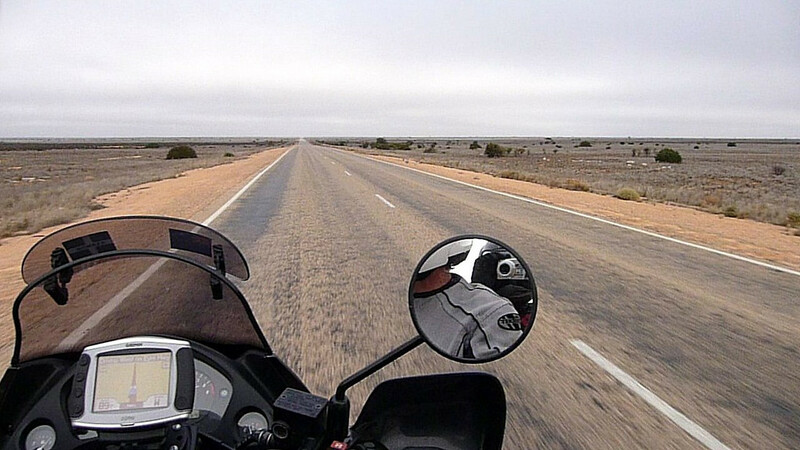 Crossing the Nullarbor Plain, along the Eyre Highway (A1), is one of Australia's great road journeys and widely recognized as a traveller’s ‘rite of passage’ .. cuz it’s something that you generally only do once. I’m not certain where the Nullarbor officially starts .. or indeed ends, but I think it must begin where we are - on this sunny and cloudless Thursday morning (March-18) - at Port Augusta because of the town’s unique geographic position as a major service centre for travellers like us and the countless massive freight trucks – the ‘Road Trains’ – that cross this vast Plain. Shortly after breakfast it was time to get going. 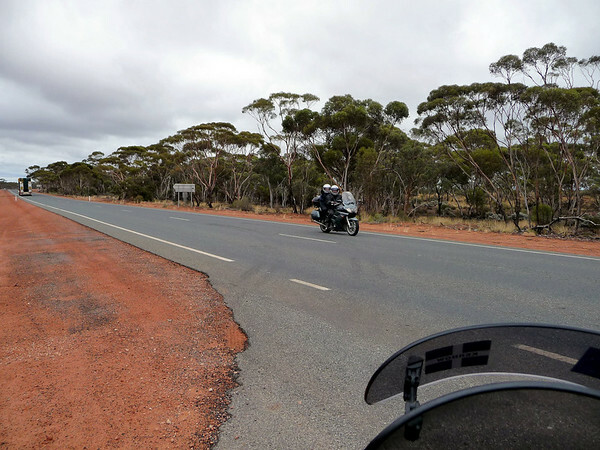 155 km [97 miles] – 1 hr 45 mins – later we pulled into the Kimba Road House for mid-morning snacks plus a fuel top-up .. and struck-up a conversation with Mick & Angie, a couple returning east from the Ulysses Bikers’ rally held in Albany, West Oz. 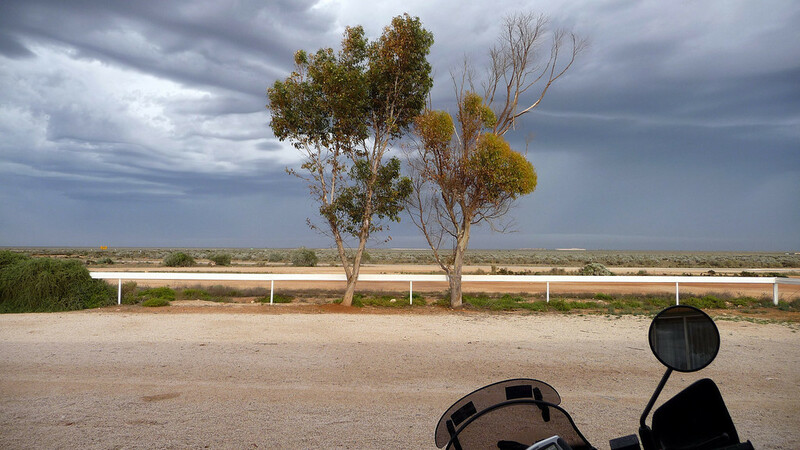 They recommend Streaky Bay as a good stopover destination for the night. 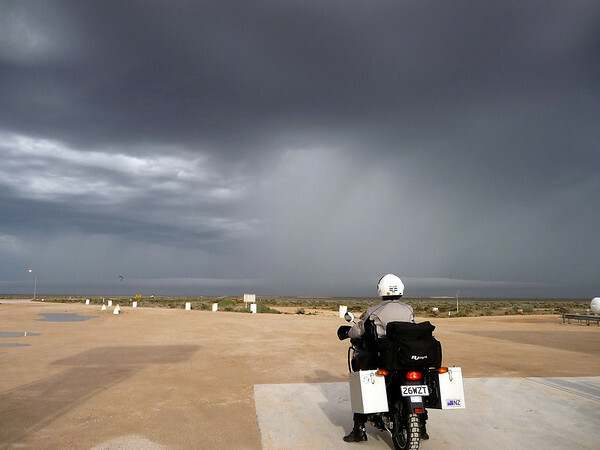 Streaky Bay it is then .. and after a further 235 km [147 mi] we reserve our accommodation at the impossible-to-miss Streaky Bay Hotel given its colonial style of architecture and sweeping views to the Streaky Bay Jetty. The following morning, Friday-19th, brings with it a mixed bag of weather. 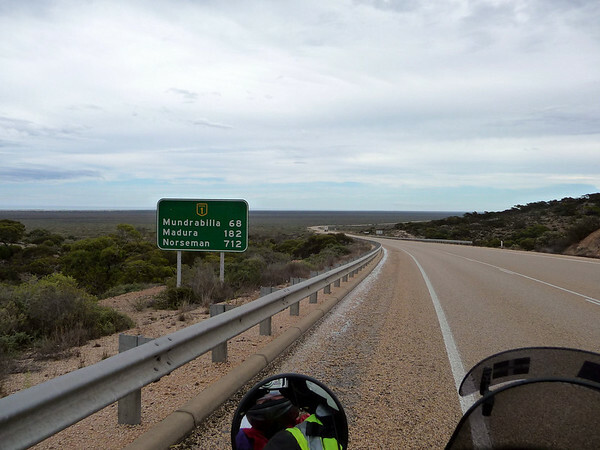 Soon we’re well into the heart of the Nullarbor. 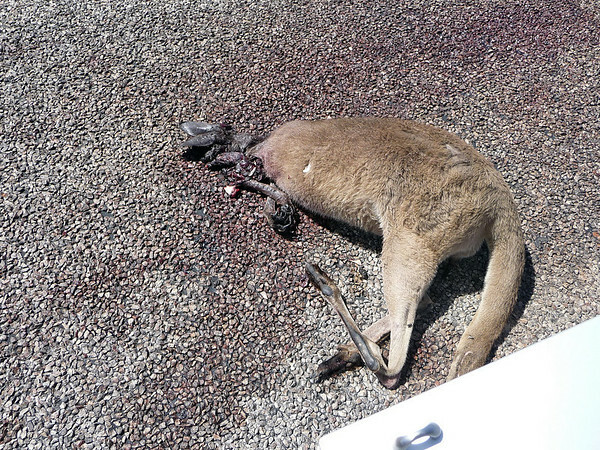 A refuelling stop at Penong reminds us to keep an eye open for stray animals .. but the only ones we see are of the road kill variety ..
.. like this roo, which must've got a real bashing around the head a night or two ago! 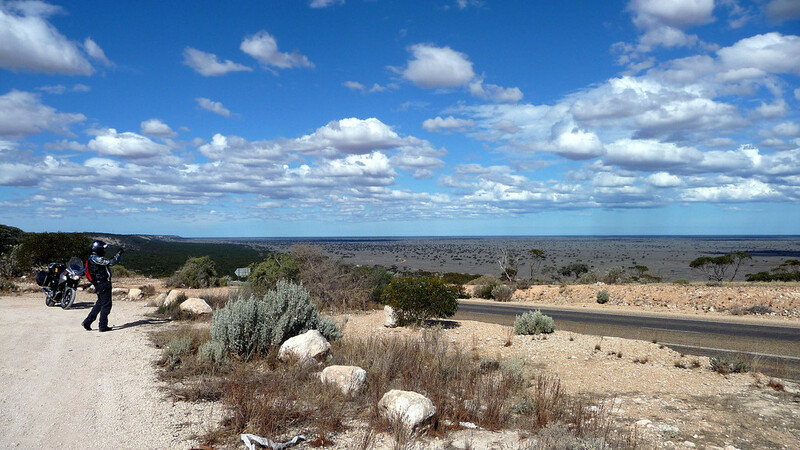 The term Nullarbor is from the Latin "nulla" for ‘no’, and "arbor" for ‘tree’; hence the term Nullarbor, meaning “no trees”. However, there are sections of this endless road that are rich in vegetation, which makes the ride a little more varied and interesting ..
.. and provides some shade when we stop to take-in another litre of water each. DAMN those pesky flies though. As soon as you stop, almost the very second later, the persistent little buggers swoop in around your face .. and just won’t take, ‘NO, P#SS OFF! ..’ for an answer! 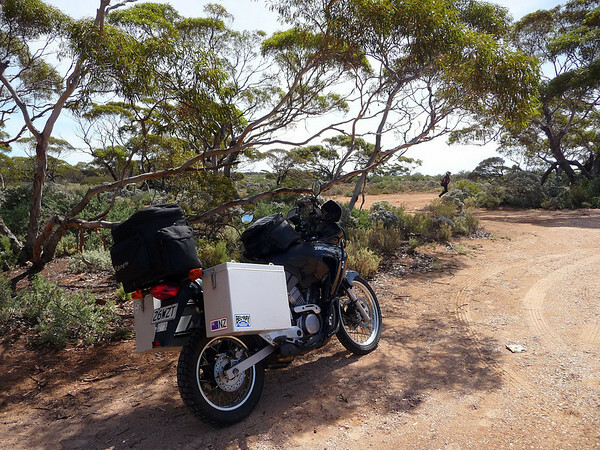 The tree lines will just disappear from time-to-time .. and the ‘Nullarbor’ then becomes true to its name. 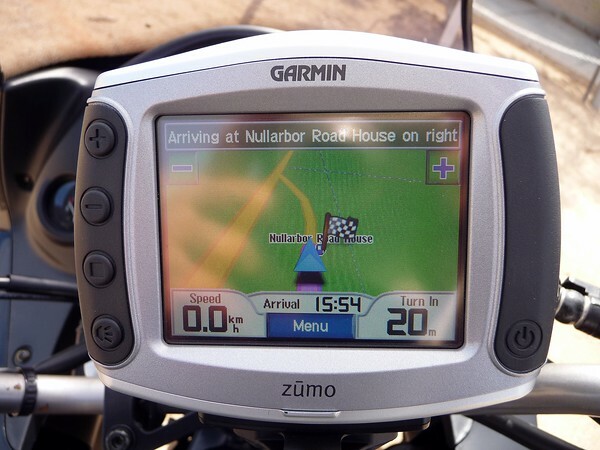 Late afternoon – and 405 km [253 mi] later – we pull-in at the only lodgings in town .. except there’s no town .. just a remote Road House, ‘The Nullarbor’ where we are expecting to pay over-the-top prices for our bed, fuel and food; and we’re not disappointed! Waking up in the middle of no-where .. wondering what the day will bring. There’s 100% cloud cover - already evident even before we open our lodge door. 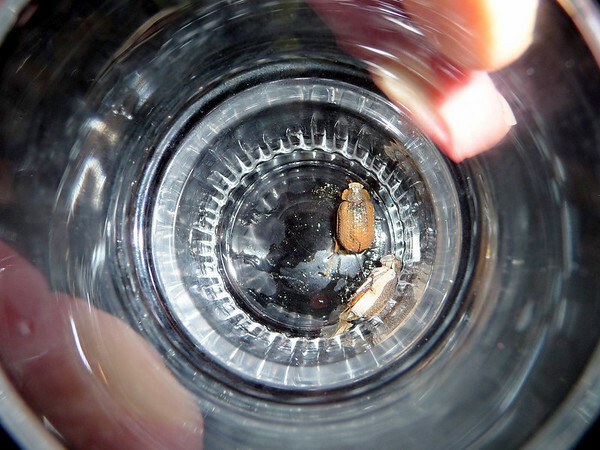 Still quite dark inside our room, we notice that we’ve shared our accommodation with a bunch of free-loading little critters .. that are scurrying about our bedroom floor looking for some breakfast. We both trample on two or three without realizing just what’s what. Stepping out, looking west towards our direction of travel .. and the weather conditions don’t look good! Now you would think wouldn’t you – looking at this picture (above) – that we might have had the common sense to put on our wet-weather gear before setting off ..
.. but we didn’t. And less than five minutes later, when the heavens open, we’re scrambling into our weatherproof overalls on the side of the road. What a pair of plonkers! 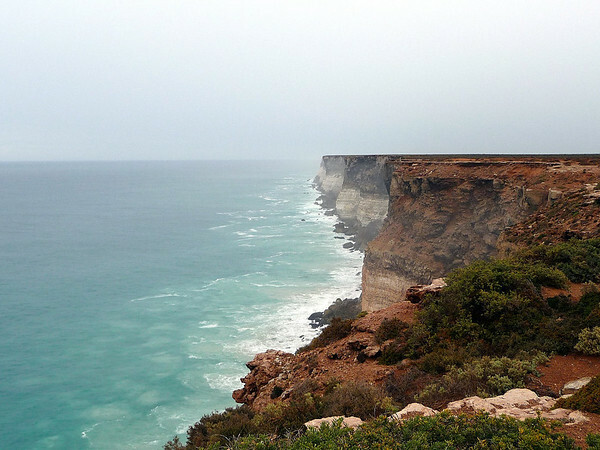 Still raining and we stop to take a peek at the spectacular Bunda Cliffs that stretch for 200 kilometres [125 miles] west of the Head of Bight. These cliffs are 70 metres (230 ft) or so in height and are the remains of an ancient ocean bed that was subject to geological uplifting millions of years ago. Something remarkable to ponder is the fact that as you drive across the Nullarbor you are in fact driving across the floor of an ancient sea bed. 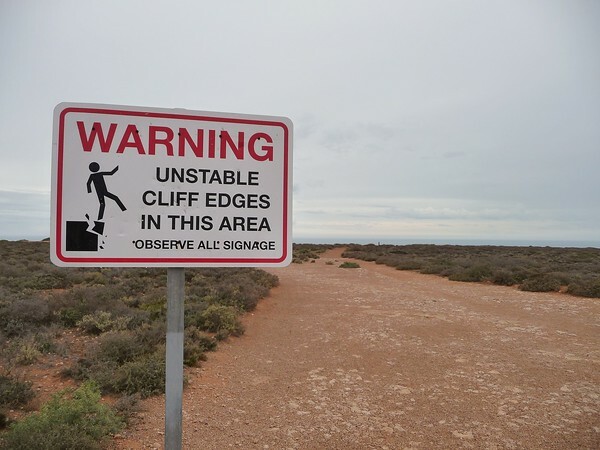 The sight of these cliffs is truly hypnotic and awe inspiring. I do, however, wish I had a head for heights! Did I ever mention that I can’t stand heights?! 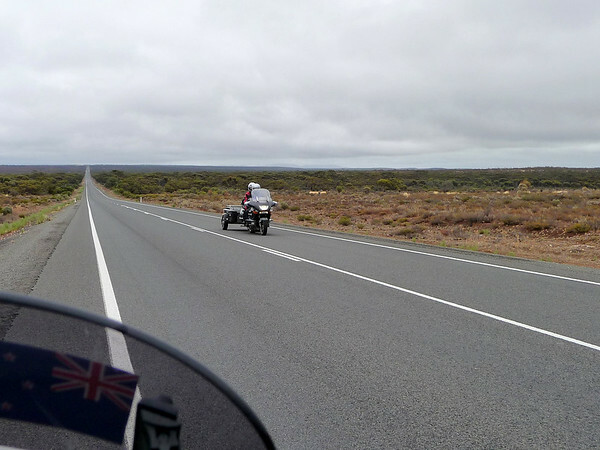 185 km [116 mi] later we’re at the South Australia / West Australia border. 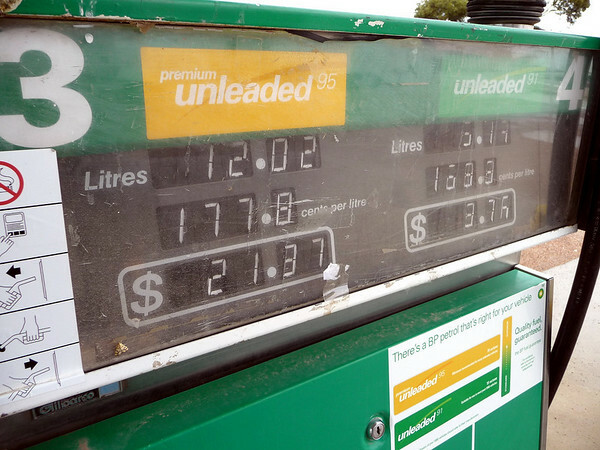 Premium unleaded petrol has soared in price to AU$1.79 / litre. What a RIP-OFF! We are forced to stop and declare if we’re carrying any foodstuffs, fruit in particular. WA doesn’t want to accidentally import any of its neighbouring state’s pests. Then something very peculiar happens to the time zones hereabouts .. and we suddenly gain 2 - 2½ hours of time .. going this far west. What’s the significance? 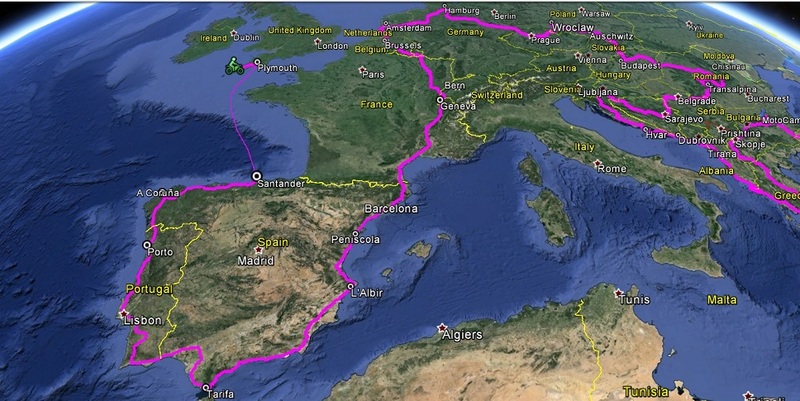 Well, it means we can ride a LOT further than we had originally planned for – like 200+ kilometers more. Mid-afternoon .. and the weather is starting to clear – blue skies on the horizon ..
.. which provides us – and other travellers – with some unexpected photo-shoot opportunities. 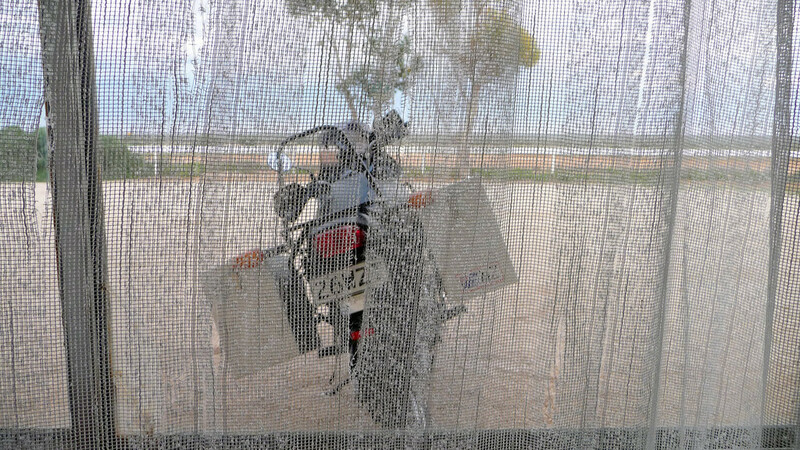 Because of the time gain, we press on .. right through and passed Madura & Cocklebiddy Road Houses – our original ‘option’ stopovers – and cover a whopping (for us) 537 km [336 mi] .. eventually reaching Caijuna, where we secure our lodgings for the night. Strange thing is that it gets dark by 6:00pm; just like being back home in the English winter - EXCEPT that the temperature never drops below 25°C, even in the middle of the night! Early to bed .. early to rise. 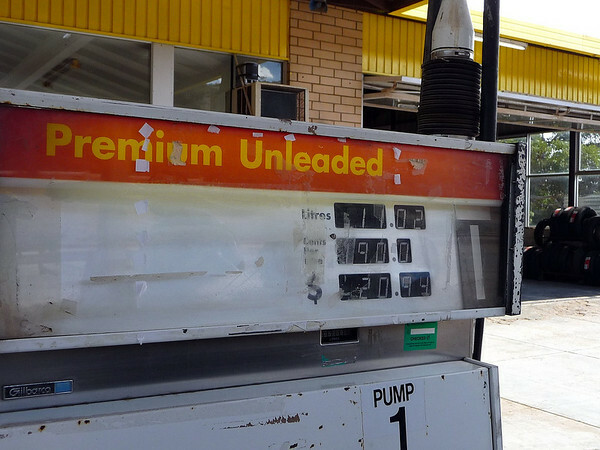 First job: top-up the gas tank .. RIPPED OFF .. AGAIN! AND it’s even worse here, in Caijuna .. a staggering AU$1.90 / litre for a drop of the good stuff! We’re on-the-road by 7:00am .. but first: let’s talk about Road Trains. Just look at the size of these muthers. As the Transalp provides little protection from wind-blast (unlike my Honda ST1300 Pan-European, which offers loads of comfort behind its fairing and power screen) I’m most comfortable riding the Alp at between 90- 95 km/h [just under 60 mph]. This means that any following vehicles travelling up to, or even slightly above the speed limit of typically 100-110 km/h, will eventually look for an opportunity to overtake me. DO let them overtake you. 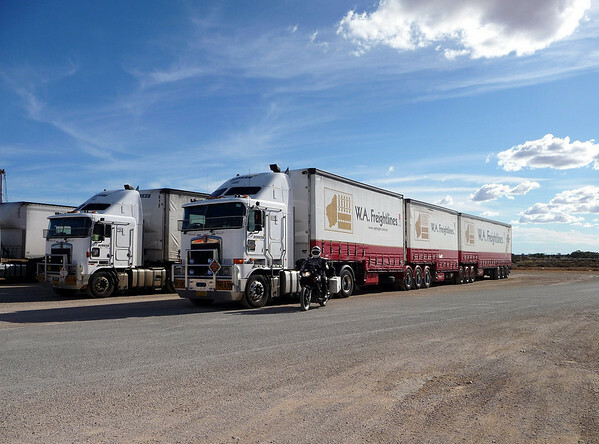 You’ll be surprised how fast most of these vehicles travel - most of them are fitted with speed limiters, and these let the truck reach 102 or 104km/h. from time to time, one will come up behind you, so let it pass. This seems self-evident, but it's clear from up there in the driver's seat that lots of people get freaked out just at the wrong moment. DO wait until the truck is out in the opposite (passing) lane, and then just ease off the throttle (brake lightly if you want) and let the train slip past. This will happen quickly, and then you can go back to your cruising speed and the truckie can keep-on earning a living. DO NOT move towards the edge of the road, as the bow wave of the truck will blow you that way anyhow, and you want some spare space. Do not accelerate away either, just let the truck pass and you will probably never see it again. 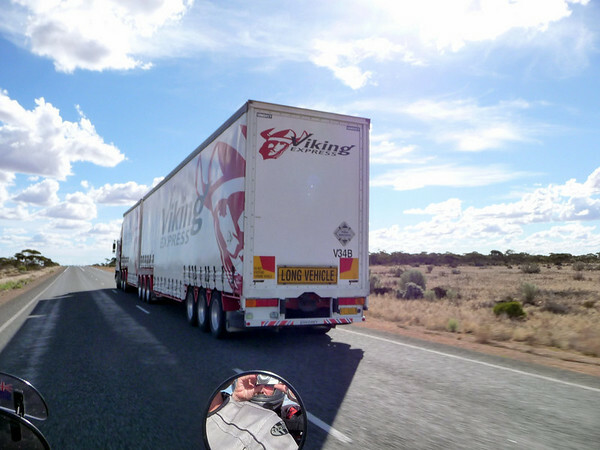 DO consider a courtesy flash as soon as the train’s tail has passed you, as this will let the truckie know that he’s cleared your front wheel. He might very well toggle his rear indicator lights in friendly acknowledgment .. and so everyone, therefore, stays the best of friends. When the truck hits a kangaroo, cow, sheep or whatever, the animal will likely exit from underneath the rear of the truck in a variety of chunks, plenty of them big enough to end your day's ride. 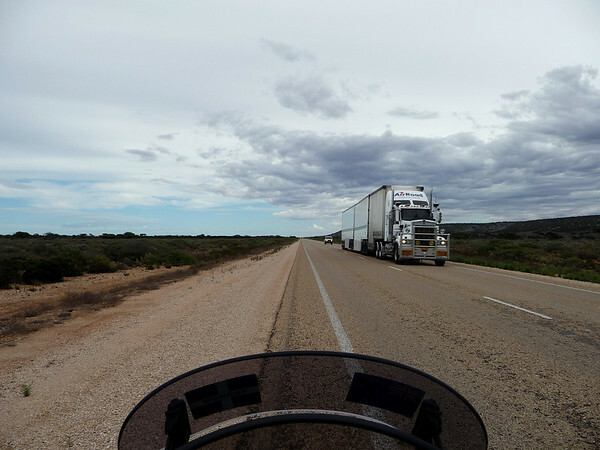 A small movement at the front of a road train can translate into a much larger weave at the rear, and all those wheels pick up a lot of gravel if they leave the asphalt or cross a broken surface. You would probably prefer not to eat dirt. Oh, and if you think you can drive a road train without kicking up dirt here and there, give it a go! It’s all good advice too ..
.. take it from me! As I said, we’re away from Caijuna by seven o’clock. The very first sign we see shortly after pulling away from the Road House is this [above]. 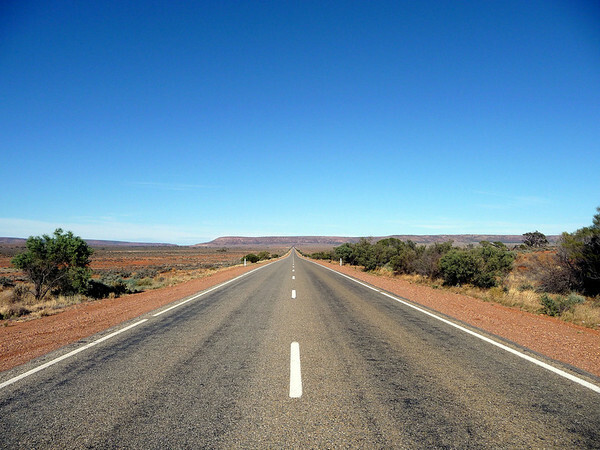 We’re about to encounter the longest straight stretch in Australia. It's a hellofa'n experience. 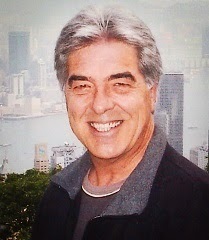 Come along for some of the ride ..
Half way along .. and it’s looking dark up yonder. We won’t be caught out for a second time! Foul weather gear donned in anticipation of yet more [warm] rain. More Ulysseans travelling back east from the Albany Meet. If we saw one, then we saw a thousand of ‘em ..
.. the majority are towing mini trailers. 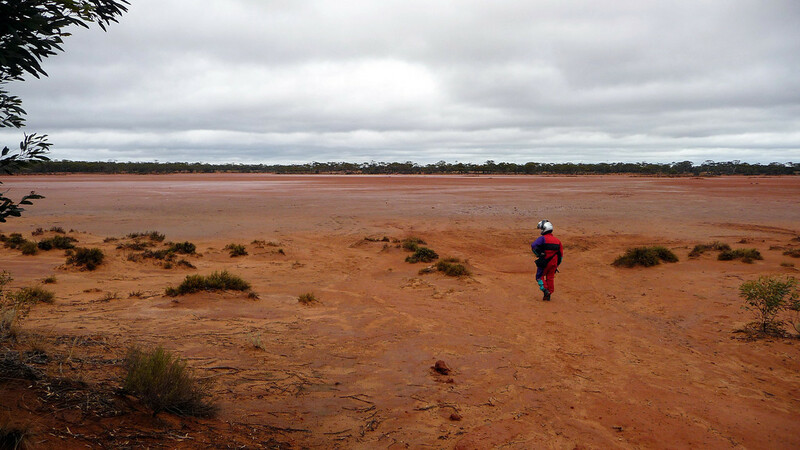 We pass-by more drying-out lakes. This part of Australia, in addition to South Aus, is also clearly suffering from the lack of rain too. Another saluting wave between bikers is exchanged. It’s an unwritten ritual .. always has been. After 375 km [234 mi], we would normally call it a day. BUT we’re here, in Norseman by lunchtime. It’s another ‘one horse town’. BUT for good reason this time, as it is said that hereabouts back in 1894 a horse named "Hardy Norseman" was tethered to a tree for the night by its owner, Laurie Sinclair. Upon returning to his horse Sinclair had the good fortune to discover that "Norseman" had unearthed a gold nugget. 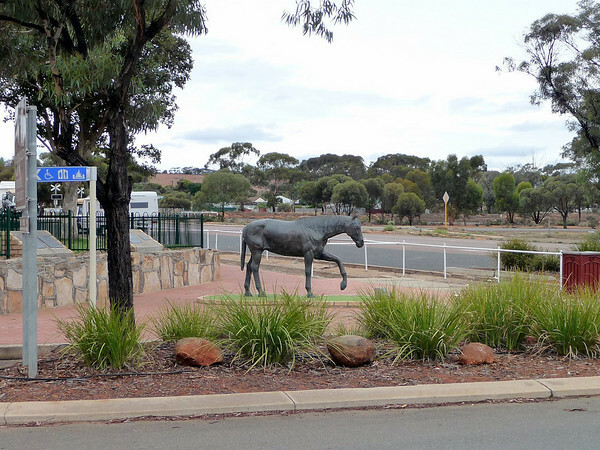 Since then a statue has been erected in honour of Norseman .. and here it is! 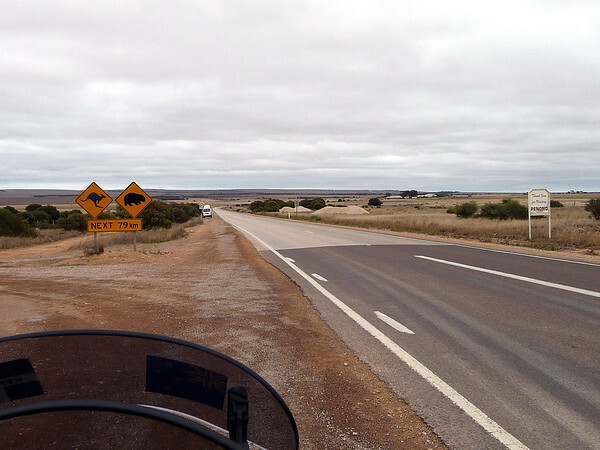 Just 2½ more southbound hours and we can be in the seaside township of Esperance. Better get going then. 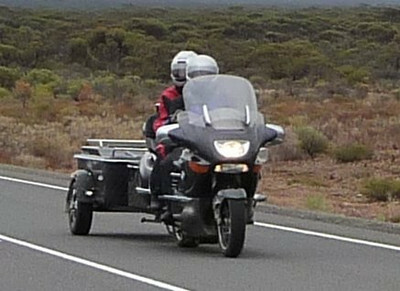 By shortly after four o’clock in the afternoon, we pull-up in the CBD (Central Business District) of Esperance, 583 km [365 mi] after leaving Caijuna at first dawn. We’re completely knackered. 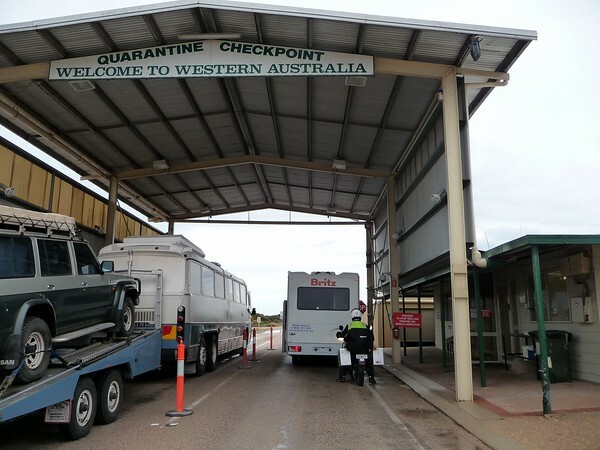 It took us just 4 days, instead of the 4½-5 anticipated; thanks in no small part to the unexpected ‘windfall’ of time we gained at the South/West Australia border. Those 2 - 2½ extra daylight hours made all the difference. 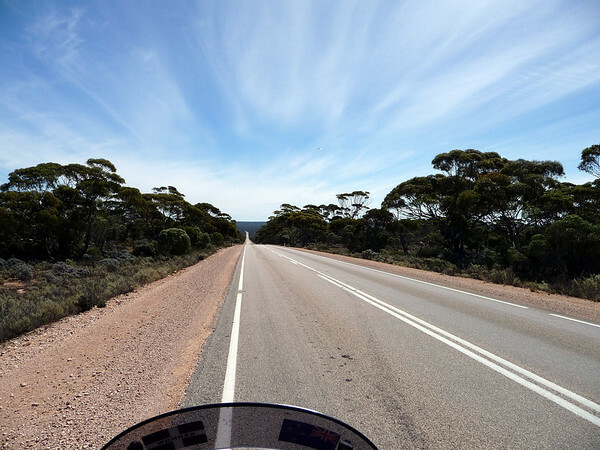 Recommendation: IMHO it’s best to travel east ~~> to west across the Nullarbor, the time zones gain(s) will mean that you can cross the entire Plain in just four days, rather than five. 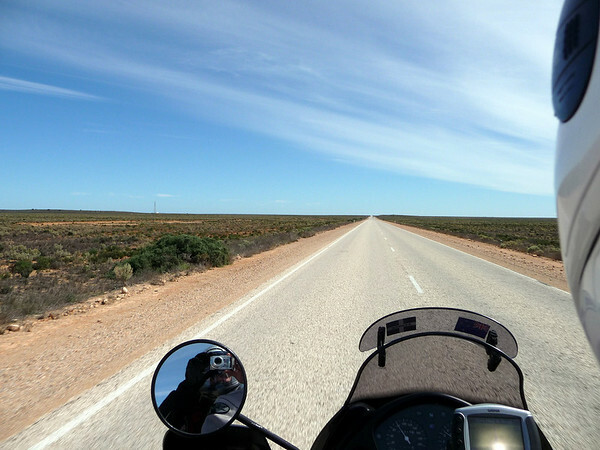 Although chances are, you will be riding into the prevailing westerly winds. 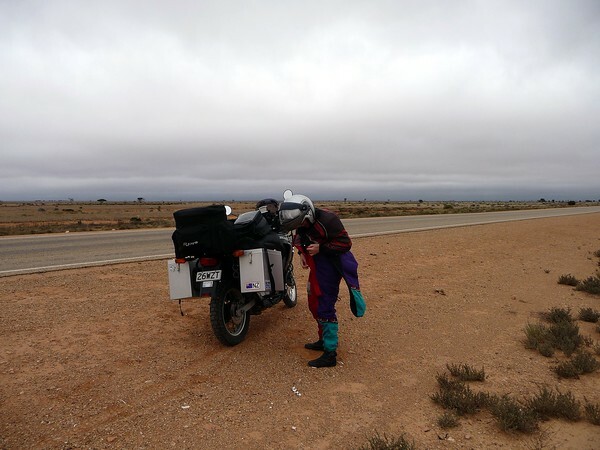 1,915 km [almost 1,200 miles] since leaving Port Augusta .. and we have now crossed the Mighty Nullarbor .. so I guess we’ve 'graduated'; we’ll probably never do it again. From now on, if either of us want to cross Australia, then we shall do the civilized thing .. and spend three or four hours in an aeroplane! 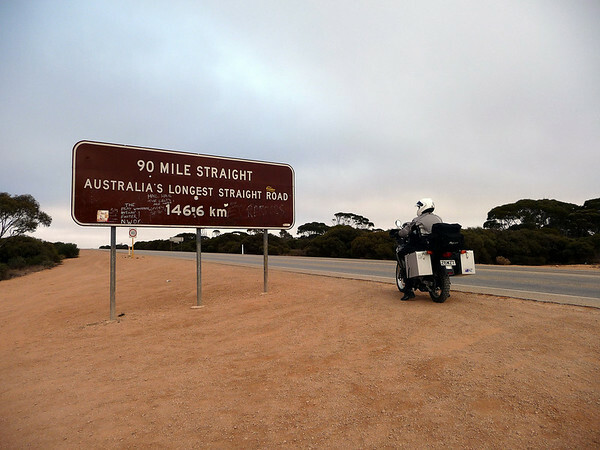 Conclusion: Was the Nullarbor the same as crossing the Great Plains of America? Well, in Oklahoma, Kansas and Wyoming you see names like Tulsa, Wichita and Laramie .. and sometimes encounter wildlife like Desert Cottontail, Black-Footed Ferret and American Bison (Buffalo). 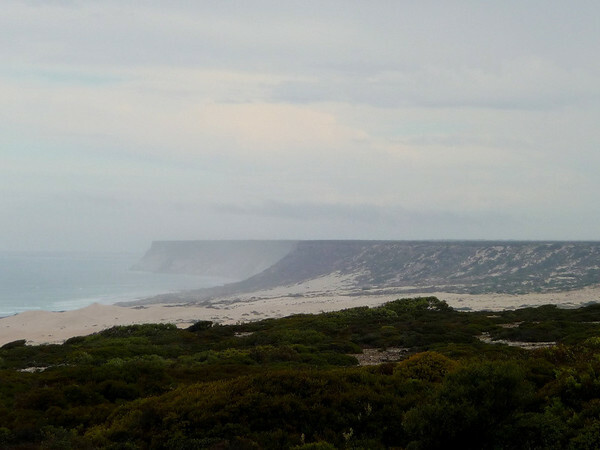 Whereas along the Nullarbor Plain you’ll pass through tiniest of little townships with names like Ceduna, Noodroo and Cocklebiddy; and come across indigenous animals such as Kangaroo, Wombat, Dingo and even Camel. The weather conditions? Well these seem to me to be remarkably similar. Thinking of doing this trip as well.